What type of program should I use? This solution explains the differences between the 3 types of events available in Altru. 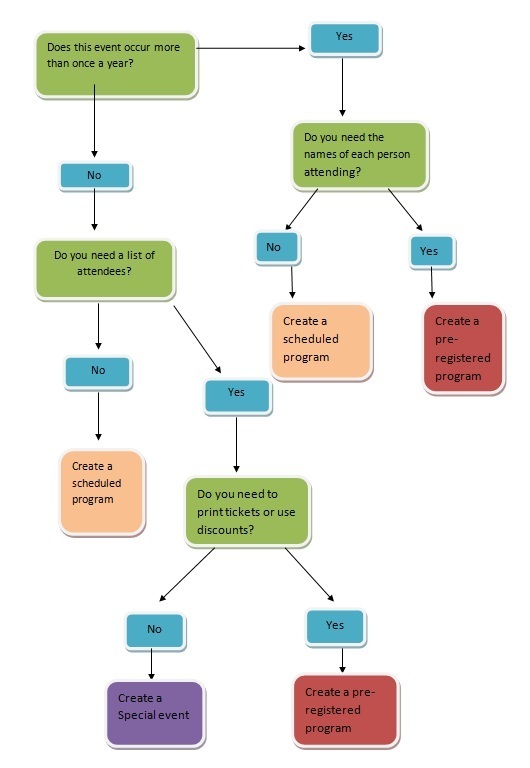 Using the information below, you should be able to make the decision of whether to create a special event, scheduled program or preregistered program. Special Events are fundraising events that typically occur once a year, like a Gala or Auction. Patrons can purchase registrations and are considered the Host and will need to enter the names of each person they are buying registrations for. In addition, special events allow you to consider a portion of the registration cost as contributed revenue and direct it to a specific designation. These types of events have the ability to track very detailed information, like lodging options, expenses and event speakers. Special Event registrations can be purchased through Advance, Daily or Online Sales (group sales is not available). You can also register Patrons via add a payment in the back office. This type of event also utilizes the mobile check-in feature allowing you to check in registrants on your mobile device. Special events do not print tickets. Scheduled Programs are events that occur daily, weekly or monthly at a specific date and time, such as a tour, performance or lecture. These are events where you do not need a list of attendees (or roster). These tickets can be sold anonymously through the Daily Sales screen. Preregistered Programs are events that that also occur daily, weekly or monthly at a specific date and time, such as a workshop, camp or class. However, these types of programs require Patrons to provide the names of each person they are buying tickets for. This allows you to get a roster of attendees. This type of event also utilizes the mobile check-in feature allowing you to check in registrants on your mobile device. To decide what type of event to create in Altru, check out the attached document and follow the workflow diagram. This will help you determine where to start in Altru.